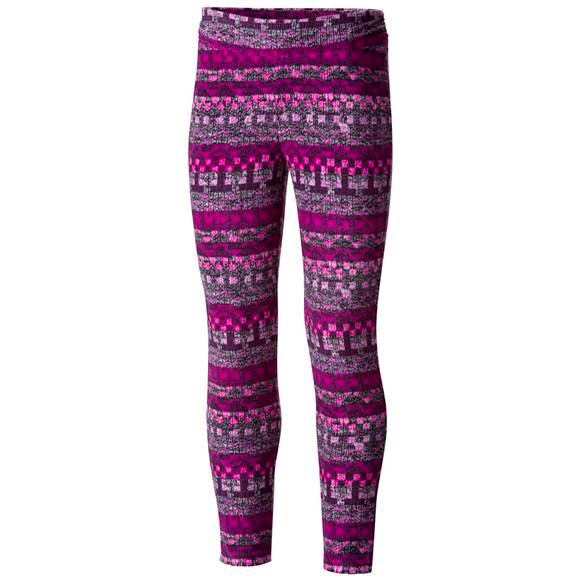 Crafted from soft and lightweight micrcofleece in an array of pretty prints, Columbia's multi-talented girl's legging excels at dynamic activity and relaxation alike. The pant is easily layered under rain or snow pants for extra insulation, but its fine-tuned, flattering design allows it to be worn on its very own. Crafted from soft and lightweight micrcofleece in an array of pretty prints, Columbia &apos;s multi-talented girl&apos;s legging excels at dynamic activity and relaxation alike. The pant is easily layered under rain or snow pants for extra insulation, but its fine-tuned, flattering design allows it to be worn on its very own. The reference standard for lightweight warmth and breathability. Moisture wicking, quick drying and stretchy for a comfortable fit, these lightweight fabrics have been a primary insulation layer of choice among experienced outdoor enthusiasts for nearly three decades. the pants are soft and warm and just enough of a second layer under ski pants to keep them warm and dry. We love them! These are a favorite for my girls! They are warm & cozy. Perfect for camping & layering in the winter. They usually last at least a couple sizes/years for my girls as we just roll them up or down as they grow. They wash up so nicely as well & don't seem to show much wear even over 2 years of use! Great product!